At 17, still a teenager, he did not hold a guitar like many of his peers at that age, but took up arms to defend his motherland. Bir Shreshtha Hamidur showed bravery just before the bullet fired from the Pakistani occupation army's machine-gun took his life away. He wanted to knock down a Pakistani gun-post. Bir Shreshtha Hamidur is a name of fearlessness and sacrifice. Not only him, Bir Shreshtha Jahangir, Bir Shreshtha Noor Mohammad, Bir Shreshtha Motiur Rahman, Bir Shreshtha Munshi Abdur Rouf, Bir Shreshtha Mohammad Ruhul Amin, Bir Shreshtha Mohammad Mostafa- all of them fought the battle in 1971 and along with others led the country to a glorious victory. To be self-governed and independent, and to free the motherland from brutal rulers, they fought risking their lives. Heroic tales could be heard from many freedom fighters who, fortunately, were alive after the battle was over. People proactively took part in the war out of sheer patriotism; those who could not fight supported the cause indirectly in many ways thus confirming the fact that this was indeed completely a people's war. 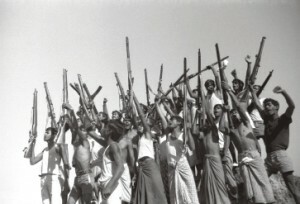 Illiterate villagers, school-going teen-aged boys, even housewives, ordinary people from every sector of society took part in the liberation war. All wanted the land to be free. Questions can be easily posed if it is a war participated and prompted by common people, then why is there no ordinary person other than a 'uniform holder' in the list of names of Bir Shreshtha, the highest gallantry award of the liberation war of Bangladesh. Akku Chowdhury, a trustee of Liberation War Museum appreciates this argument regarding the liberation war even after thirty-nine years of independence of the country. Out of three million martyrs only seven were awarded the highest gallantry award of the state- the Bir Shreshtha Khetab. Chowdhury considers giving such awards to only seven freedom fighters as a symbol of respect for the whole nation that fought the battle and aspired to be free. These seven Bir Shreshthas are an inspiration and icon for Bangladesh. “It was difficult to monitor the greatness of the sacrifice of each freedom fighter at that time,” said Akku, adding, everyone wanted the country to be free, and fought of his or her own volition. The activities and deeds of members of armed forces during the war could easily be regulated and monitored, and thus they had the chances to be recommended by the commanders, under whom they fought, says Akku Chowdhury. Yet, the utmost and glorious award for valour is limited only to seven uniformed freedom fighters. “The scope to reward the freedom fighter is not over yet, there are a number of freedom fighters in the country to whom we do not pay due respect and honour, they are not even well recognised despite their great sacrifice and intrepidity during the liberation war. Of a good number of gallantry awards-Bir Uttam, Bir Pratik, Bir Bikram- we see only two female freedom fighters being rewarded with such awards, that is certainly a tragedy,” observes Akku. Initiatives can be taken to identify the freedom fighters and to make a list of the martyrs in the liberation war. “The national census might include a provision to ask people whether or not they have lost any family person in the liberation war,” says Akku Chowdhury regarding the initiative that could be taken by the state to identify martyrs and freedom fighters and put together authentic records.